It's Woodstock for Ceph Nerds! Welcome! 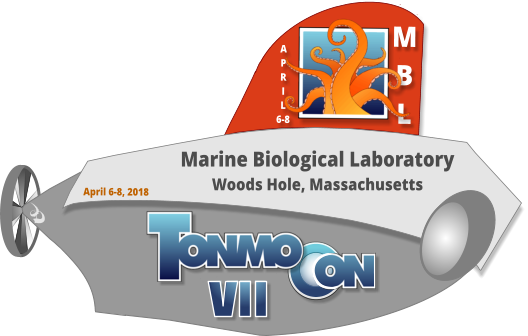 We're very excited about our next cephalopod conference, TONMOCON VII at Marine Biological Laboratory — Biological Discovery in Woods Hole from April 6-8, 2018. 3-Hour Evening Social Mixer (beer & wine)...it's like a red carpet for ceph heads! "The Missing Ink: Innovations to Cuttlefish and Squid Husbandry"
"Underwater Neighbors: The ecology of two octopus species in a Florida lagoon"
"It's like Airbnb, but with octopuses: A vision for tank space hosting"
"Cephalopod Water Quality and Life Support Design"
"Scientists Seriously Can't Handle This Adorable Lil' Stubby Squid"
Summary: Work with cephs? Hold on with your suckers, you've got scicomm gold! The team behind the googly eyes seen around the world shares takeaways from expedition outreach and social media aboard Exploration Vessel Nautilus. Curiosity and excitement is contagious, and sharing what happens behind-the-cephalo-scenes makes studying and exploring even the deepest reaches of our planet seem possible for the next generation of explorers, scientists, and engineers. Come for the #scicomm tips, stay for the squid vids. "Pyjama Prints: Identifying Individual Markings of Sepioloidea lineolata"
"Using Modern, Innovative Methods to Save an Ancient Animal: Deep Sea Conservation of Nautiluses"
"Arm in arm: MBL collaborations advance microinjection methods for Cephalopod lineage analysis and transgenesis"
"Octopus Hatchlings Flash Red When Exposed to Ketamine"
Summary: Zdenek Lajbner, Reuven Pnini, Jessica Gordon, Courtney Timmons, Michael Kuba, Tamar Gutnick, Eric Edsinger, Jonathan Miller -- Several species of octopus hatchlings flash red chromatophores in vitro at an ambient background rate. Low concentrations of ketamine significantly and reversibly increase the frequency of red flashes, with insignificant mortality to the animals. These experiments suggest the potential suitability of cephalopod hatchlings for high-throughput screening of pharmaceuticals, in particular, neuroreceptor [ant]agonists, wherein conventional assays are expensive, awkward, and unreliable. It further opens the possibility that ketamine could decouple the mapping of visual field to optical cortex from the mapping (if any) of optical cortex to skin. "Cephaloproblem Solving: An Anecdotal Guide to Navigating the Health and Welfare Needs of Giant Pacific Octopuses (GPOs)"
Summary: At a site level, SEA LIFE Michigan has been able to employ various problem-solving strategies to ensure the best possible care for our current Giant Pacific Octopus, Mera. These approaches will be exemplified through the study of two comprehensive treatment programs that we have employed with Mera over the past couple of years. By illuminating and resolving two separate husbandry-related issues, we were able to generate protocols and make recommendations that other SEA LIFE sites would be able to reference. In order to create a community within the eight North American SEA LIFE sites, where aquarists can reference treatment plans like this, discuss husbandry-related questions, problems, and ideas, SEA LIFE Michigan spearheaded an effort to create the SEA LIFE National Cephalopod Working Group. This group has been up and running for six months, and has allowed aquarists from every North American SEA LIFE site to coordinate with one another in regards to cephalopod operations. Beyond coordinating on a national level, SEA LIFE also supports a Global Octopus Working Group, comprised of researchers from around the globe. This group is focused on Cephalopod research and exhibit development. By focusing on problem-solving strategies at a site level, national level, and global level, SEA LIFE is working to establish the best possible standards of care for our animals while also investing in a well-connected and capable husbandry staff. These broad topics will be covered primarily through the lens of everyday husbandry and problem solving with SEA LIFE Michigan's GPO, Mera. "Cephalopods Are The New Dinosaurs"
"Next Top Model: Choosing the First Cephalopod Genetic Model Species"
"Say hello to my little friend: beneficial relationships between bacteria and squid"
Summary: The 2nd edition of this book (2017, Cambridge University Press; with coauthor John Messenger) summarizes the wealth of exciting new research data stemming from over 500 papers published since the 1st volume appeared in 1996. It adopts a comparative approach to causation, function, development and evolution as it explores cephalopod behavior in natural habitats and the laboratory. Each of the 11 chapters will be explained and illustrated in this presentation. Extensive color and black-and-white photography and video illustrate various aspects of cephalopod behavior to complement the scientific analyses. Covering the major octopus, squid and cuttlefish species, as well as the shelled Nautilus, this is an essential resource for undergraduate and advanced students of animal behavior, as well as researchers new to cephalopods, in fields such as neuroscience and conservation biology. By highlighting the gaps in current knowledge, the text looks to inform and to stimulate future study of these beautiful animals. "How to make an octopus: insights from the genome"
"Gatsby's Green Light: Locally Sourcing Food For Non-native Cephalopods"
"Euroceph: What has the change in legislation meant for the european cephalopod community?" "Optimizing Ova Production: Striped Pyjama Squid, Sepioloidea lineolata"
"How to make an eye: The evolution and development of the squid visual system." "Measuring Hormones in Cephalopods: a New Noninvasive Technique"
"Establishing a novel model for cephalopods: development of genetic tools in pygmy squid"
"Dissecting the Structure and Function of Cephalopod Chromatophores"
"Working with the Fishing Community to Study Squid Fisheries, Oceanography and Distributional Ecology"
Summary: Squid are an important component of marine ecosystems and support commercial and recreational fisheries. Environmental effects on squid distribution create complex problems for the management of seasonal fisheries at multiple scales. Fishermen and scientists are working together to decompose these complex problems into testable scientific hypotheses, bringing a variety of skills and disciplines together to conduct collaborative research and fill data gaps vital to management of a sustainable fishery. Integrating fishermen's knowledge and expertise with the scientific method has led to novel research and new insights into squid distributional ecology. Understanding how ocean temperature and other environmental factors drive when and where squid go has important implications for fisheries science and management. "How will cephalopods fare under climate change?" "Octocams: A simple scalable system for short-term to lifecycle monitoring of behavior in aquaria"
Owen Nichols will lead this station and has arranged for some guest squid fishermen and additional props. Thanks Owen! 4. NOAA Aquarium special access! Final arrangements coming together. The aquarium is usually closed during this day/time but the team is working on an exception for an hour or so following our conference. Email me or private message me if you have questions / special needs. Please use #tcon7 in social media mentions. Questions? Email me or just private message me here on TONMO.